The game has rules but no stakes. 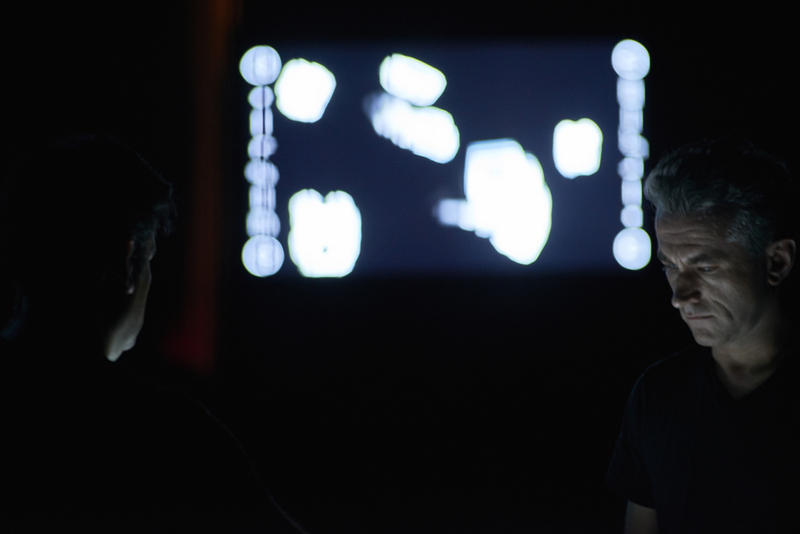 Two men kneel either side of a digital interface, the display projected on a large screen for the audience’s benefit. On the screen, a series of dots and dashes each emit their own particular squeal, sigh or belch when set in motion. The men take turns tapping the interface, dragging the geometric flotsam and jetsam from the margins to sonically cross-contaminate. This produces a human-sounding hubbub that distinguishes the shapes as the Disruptive Critters of the work’s title. The result of the Duckworth Hullick Duo’s collaborative practice, Disruptive Critters is presented in a double bill for Melbourne Music Week with City-Topias. Sharing performers and a childlike sense of wonder, both shows foreground play as a fundamental mechanism of the creative process. In Disruptive Critters this delights the children in the audience, who respond positively and audibly to the humorous grumbling and groaning that the shapes’ interactions and combinations generate. This gleeful response is perhaps further provoked by the framing narrative that features a child protagonist (Astrid Bolcskey-Hullick) in the role of the god-figure from whose mind and whims the game and the critters seem to emerge. However, it’s ultimately these efforts to frame the interface at the centre of the work with external theatrics that sees the appeal of the performance eventually wane. Between each level or scene of the work’s game, the three performers enact rituals, carefully laying pebbles out across the stage and walking slowly with arms outstretched from station to station. These actions, with their measured speed and air of importance, perform purpose. But their inclusion implies a lack of faith in the interface’s ability to immerse the audience. The intent here, in cloaking the technology in a narrative of gods toying with their creations, is not misplaced, as without it the show is, in effect, just two people playing a videogame for 45 minutes. But the performative elements appear to be the afterthought of the work’s digital world-building, and consequently the piece’s creation myth lacks visual sense. At work’s end, the theatre fills with a thunderous rumble, as the digital imagery zooms out from the flat field of play, contextualising the many writhing, squeaking, growling shapes as specks collectively comprising a much larger globe. This image brings unity to the piece’s themes of disruption and creation in a manner that circumvents clumsy theatrics in favour of a clear graphic statement. And while the message is not earth shattering, the revelation of some bigger picture provides Disruptive Critters with the meaning it elsewhere failed to locate. To this end, City-Topias, like Disruptive Critters, employs the ritualistic as an organising principle. Dressed in a fur and feather headdress, Zzaa initiates the show by wafting pungent incense throughout the performance space. She then assumes her position as VJ behind an audio-visual desk, projecting mystical imagery of labyrinths and stars and nebulously philosophical lyrics onto the big screen for the duration of the performance. 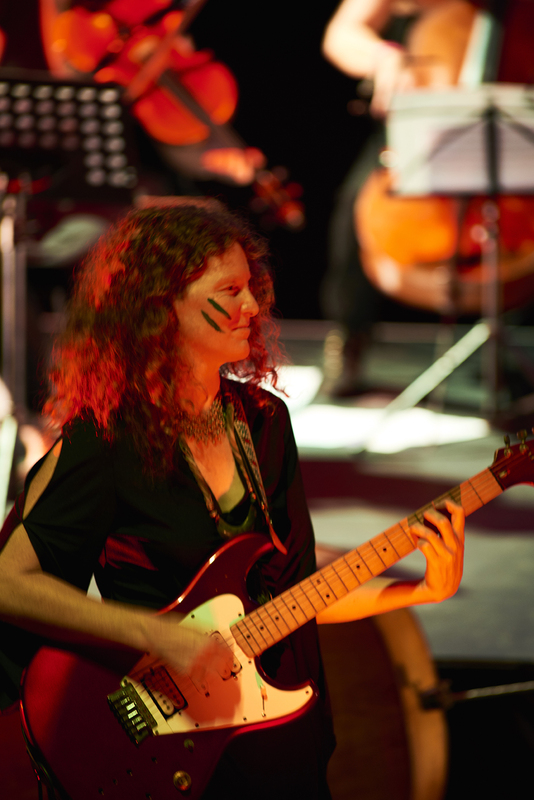 Entering the space, the musicians also assume the pose of the ceremonial, their faces painted with colourful slashes of war-paint. Flautist Belinda Woods sits before the digital interface with her flute, playing short, breathy notes that fill the space with anticipatory tension. 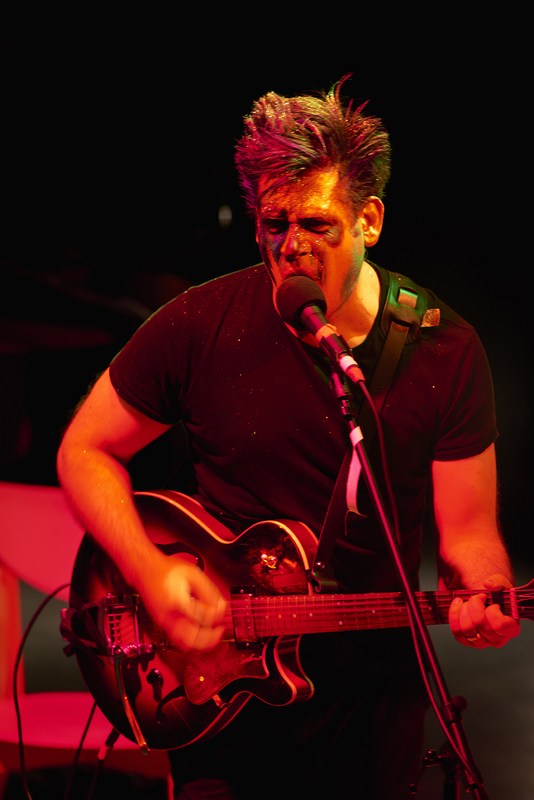 Hullick, face smeared with glittering paint, takes his place as frontman, emitting a guttural drone at the microphone and intermittently plucking at his guitar. Amid the swelling commotion there is a suggestion of the carnivalesque, discordant sonic and visual elements uniting in a manner that renders the absurd significant in the work’s exploration of social configuration. This thematic focus on rituals and organisational methodologies is realised more fully in the diverse modes of instruction that shape each of the atonal pieces that make up City-Topias. At times an onscreen interface is employed with various members of the ensemble spinning, aligning and highlighting a series of circular graphics complementing the movement of the composition. In one piece, Woods conducts the ensemble with an enchanting physicality that characterises her as sorceress or sibyl with her sweeping numerical gestures. Yet often the musical content is less remarkable than the means by which it is being produced. In particular the more lyrical songs tend to invoke the mythic, building to electrifyingly cacophonous summits only to be flattened by the vocals steering the work into the predictable territory of maudlin rock opera. Everyone involved appears to have been given the opportunity here to play out their distinctive contributions, the joy apparent in the multiplicity of ideas and methods that have been implemented. Indeed, there is pleasure to be found in watching people revel in the creative process, but what is missing in City-Topias is a cohesion that the vague thematic arcs cannot bring to the performance’s disparate elements. Trying to strike a balance between order and disorder, disarray and design, the performance regularly falters either side of this equilibrium. There are moments though when this balance is achieved, as in Heterotopian Manifesto. 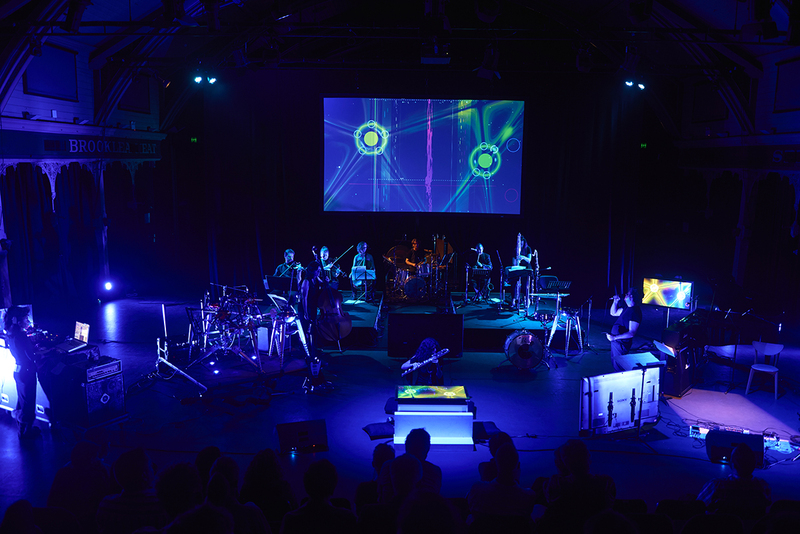 Here the score is projected onto the screen, letting the audience witness the performers’ interpretation of a series of colour-coded brushstrokes spattered and slashed across the musical stave. The dissonant outbursts and frenetic spates are thus visually contextualised as part of some grander plan in a manner that reflects the heterotopia of the title, and touches upon notions of the polyphonic. If this piece is indeed the performance’s manifesto, then it realises the chaotic cohesion it preaches in a way that the rest of the program’s works don’t quite manage. There is great value in the sense of fun and experimentation that both City-Topias and Disruptive Critters bring to the field of sound-based performance. Experimental practice is often imbued with a tone of high seriousness, as if to justify its divergence from established norms; the inherent exuberance and wonder of noise-making sometimes seems sorely lacking. On the flipside, that wonder can be denied an audience when the performers become enraptured by their own delight. I leave City-Topias glad to have witnessed skilled performers ply their craft with great joy, but am left wishing I could access their sense of revelation from my place up in the bleachers. For a different response to Disruptive Critters and City-Topias go here. Read an interview with James Hullick about Disruptive Critters and City-Topias.